"She smiled a soft, troubled smile and I felt the whole world slipping away, and I wanted to slip with it, to go wherever she was going... I had existed whole years without her, but that was all it had been. An existence. A book with no words." Tom Hazard has just moved back his to London, his old home, to settle down and become a high school history teacher. And on his first day at school, he meets a captivating French teacher at his school who seems fascinated by him. But Tom has a dangerous secret. He may look like an ordinary 41-year-old, but owing to a rare condition, he's been alive for centuries. Tom has lived history—performing with Shakespeare, exploring the high seas with Captain Cook, and sharing cocktails with Fitzgerald. Now, he just wants an ordinary life. 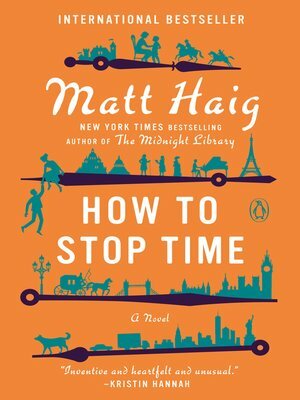 How to Stop Time tells a love story across the ages - and for the ages - about a man lost in time, the woman who could save him, and the lifetimes it can take to learn how to live. It is a bighearted, wildly original novel about losing and finding yourself, the inevitability of change, and how with enough time to learn, we just might find happiness.